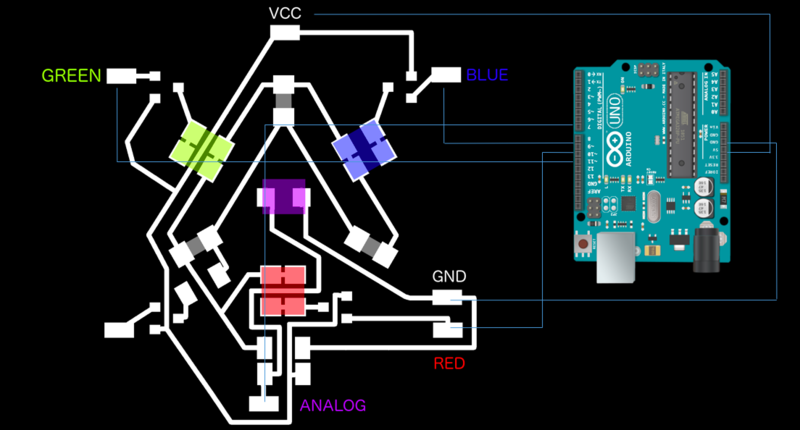 Connect the Arduino Uno to the USB port. Open the Arduino software select the port connected to the arduino (Tools -> Port). Load the following code into a sketch and upload the sketch. for(j = 0 ; j < 4 ; j++) // CYCLE PINS and set pins low. for(i =0 ; i < 255 ; i++) // CYCLE PWM VALUES - this changes the brightness of the LED from 0 - off to 255 - completely on. Serial.println(1024-analogRead(0)); // PRINT VALUES - to view these open the serial monitor. You should see the lights alternating and each color increasing in brightness. 1) Firstly my Phototransistor was soldered on backwards and I was therefor not getting any readings that made sense. 2) You can only draw lines in the draw function. size(700, 700); //Set canvas size. 1) The Green light is extremely dim and will need to be replaced by a more effective Green LED. 3) I will need to calibrate light sensor.